So I put Strava on my phone. Strava, for those not acquainted with it, is an app which tracks your route, how fast you go, how long you take and so on. And then the really evil bit – it compares how fast you ride each ‘segment’ with other riders who have followed the same route (or bits of the route). If you are fast enough, you get an award, a place on the leader-board and a ‘King of the Mountain’ (KoM) badge. This has also sparked some controversy, as it may encourage people to ride too fast or take risks in order to improve their score. Given the somewhat competitive nature of Australian commuter cyclists (something from which I am not immune) I’d say this is pretty much inevitable. Still, I thought I’d give it a go, as being able to measure the distance and speed of different routes to work seemed interesting. So far, I have used it twice. The first time I was riding the Radish, the second my fixie. So what interesting things can we glean from this experiment? 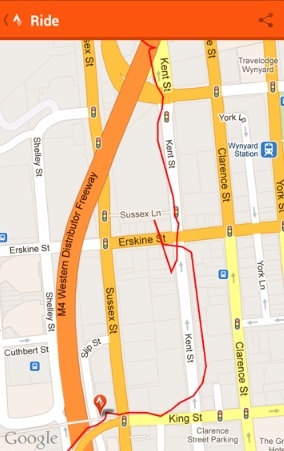 Well, on the Radish my average speed was 17.6km/h, whilst on the fixie it was 24.2km/h. This means it took me an extra six minutes to get to work (even though it was a slightly shorter route). However, it takes me about 10 minutes to have a shower, and on the Radish I can ride to work in my regular clothes – which confirms my suspicions that a slow, cruisy ride on the Radish actually gets me to work (as in ‘at my desk’) quicker than the fixie. I don’t remember making that detour from the Kent St bike lane, but there you are. From memory there’s a cupcake shop on that corner with Erskine St, so if you were in there buying a dozen mini frosted cupcakes when a guy on a cargo bike came hurtling through the display at 50km/h, please accept my sincerest apologies. 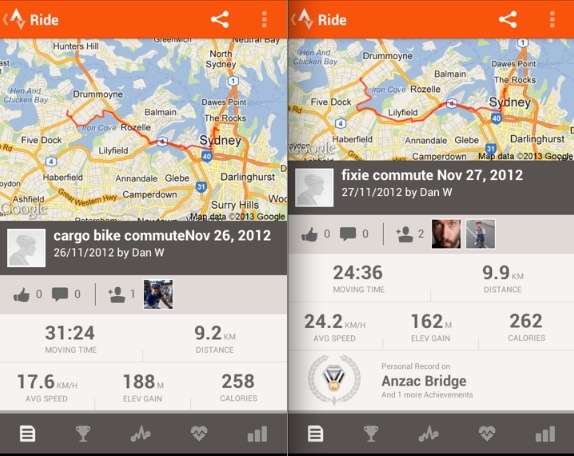 I can also use Strava to find out how I compare to other Sydney racers commuters. 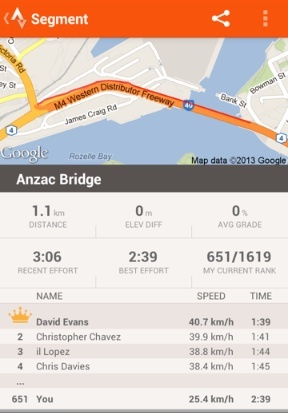 Apparently I am the six-hundred-and-fifty-first fastest person to ride over Anzac Bridge – and am about 25 seconds faster on the fixie than on the Radish. I’ve no idea when time of day David Evans screams over at 40km/h, (nor what kind of legs he has), but I can only hope either it’s at three in the morning when there are no pedestrians on the path or he’s riding on the road. Apparently if you pay for a premium Strava subscription, you can see different leaderboards for different categories. So for example I could feel good about the fact I am actually the fiftieth fastest in the ‘old curmudgeons riding cargo bikes in thongs’ category, or tenth fastest in the ‘obsessed with fixies but have very weak legs’ category. It costs $6 a month for such ego-boosting features. So there you are – my experiences with Strava. So far I’ve only used it those two times, and to be honest, I probably won’t use it often. Whilst I tried to resist I was not immune to the temptation to push a little harder (well, on the fixie at least. On the Radish I just cruised along as usual), and whilst that’s be fine in some circumstances and on some routes, I can’t help feeling Anzac Bridge at rush hour isn’t one of them. 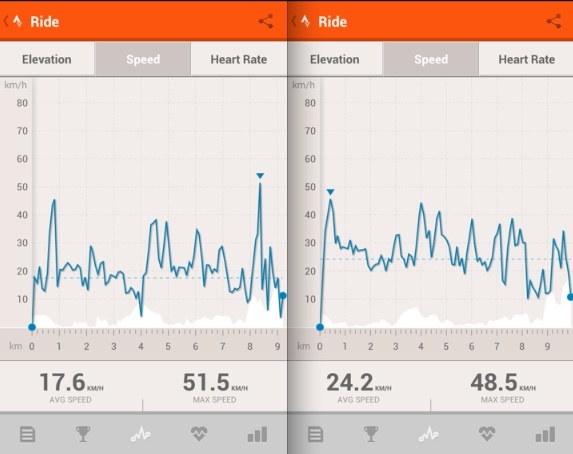 Still, if you love Strava and it helps you train more often and harder good luck to you. I can see how it could be motivational. Just be careful out there, and remember beating your personal best on some phone app is less important that the comfort and safety of both yourself and other road and path users.